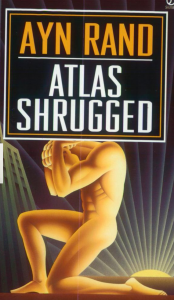 I happened to start reading Atlas Shrugged by Ayn Rand today, inspired in part by Joe Woodhull’s recent undertaking of it. [mainbodyad]Back in 2004, I picked up a copy in Rehoboth Beach when Aaron, Jocelyn and I went to visit a mutual acquaintance of ours and hang around Washington, D.C., the Chesapeake Bay, etc. It was a 35th anniversary edition on sale for only $8.98 at a store called Atlantic Books and I couldn’t help but pick it up because of the bargain price. It has migrated from college dorm room to apartment, then back to the Midwest. The great oak tree had stood on a hill over the Hudson, in a lonely spot of the Taggart estate. Eddie Willers, aged seven, liked to come and look at that tree. It had stood there for hundreds of years, and he thought it would always stand there. Its roots clutched the hill like a fist with fingers sunk into the soil, and he thought that if a giant were to seize it by the top, he would not be able to uproot it, but would swing the hill and the whole of the earth with it, like a ball at the end of a string. He felt safe in the oak tree’s presence; it was a thing that nothing could change or threaten; it was his greatest symbol of strength. One night, lightning struck the oak tree. Eddie saw it the next morning. It lay broken in half, and he looked into its trunk as into the mouth of a black tunnel. The trunk was only an empty shell; its heart had rotted away long ago; there was nothing inside – just a thing gray dust that was being dispersed by the whim of the faintest wind. The living power had gone, and the shape it left had not be able to stand without it. What an unbelievably, fantastic metaphor for formerly great institutions that retain their outward glory but are nothing but hollow shells, rotted from the inside. Whether government, churches, universities or corporations, it describes exactly what happened to so many things that once held great promise but that died long before the public realized it. Likewise, it is a brilliant statement on faith and the folly of putting it in symbols. The only thing we can rely upon is our own rational choices. Everything is ephemeral. Even my favorite company in the world, Berkshire Hathaway, will someday cease to exist in its current form. Who would have ever thought AIG would collapse? The betrayal Eddie feels is the shattering of his misplaced trust and the loss of his sense of security. People like permanence, even though it doesn’t exist. Even the world’s strongest mountains can be worn down by drops of water, given enough time. What makes humanity interesting is the reaction to the great oak tree collapsing. Most people act as if the tree had always been defective and that there were never any good days. You see this in situations where the revealing of a disgraced pastor causes a long-time parishioner to lose faith, saying he was “always” rotten, which may not be the case. Other times, they go on a jihad against all things resembling oak trees. “Well, this oak failed, so we will cut down all oaks,” such as the communist movement in the early half of the 20th century that sought to destroy capitalism because certain forms of capitalism had repressed the people in their nations. The only time my “great oak tree” was struck by lightning was my freshman year of college between 9 a.m. and 11 a.m. on September 11th, 2001 before we knew it was a terrorist attack. There was speculation that it was a military strike by a foreign power and for the first time in my life, I remember looking at the ground and thinking, “I’ve always taken it for granted that this soil was the United States of America.” You could hear the military helicopters flying overhead, since we were only 35 miles or so outside of lower Manhattan. It had never occurred to me that the United States could be invaded. Suddenly, everything seemed vulnerable. All I wanted to do was get back to my family in Kansas City. If it were an attack, at the very least we would be together. [mainbodyad]You see, I had two great oak trees – one was a belief that domestic tranquility was part of the very fabric of America – and the other was a sense that people acted rationally and naturally sought peace. Later, when we discovered that terrorism was involved, it made no sense to me because, with very few exceptions, there is a near 100% failure rate for terrorism in history achieving any meaningful political objectives the people behind it desire. This is because of the psychological principal of reciprocity. If you injure someone, they no longer care about helping you achieve your goals, even if you would have otherwise agreed with them. What great oak trees do you have in your own life? Find out and tear them down before they are destroyed.